Yes, you read that right. My head is in the “cloud,” not clouds. By “Cloud” I mean those gi-normous computer databases out there in the World Wide Web that run online software programs that make my life so much easier. 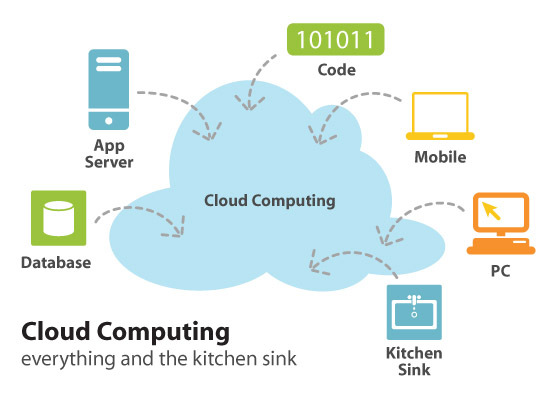 Make no mistake: the Cloud is the future of computing. I predict that within a decade, a majority of the work you currently use desktop software for, will be replaced with software on the web. Omnipresence: if you’re always on the go, and/or like me, you find yourself using multiple computers frequently, web-based applications allow you to “set up shop” anywhere you have an fast internet connection. Always Current: using web-based applications means that you’ll always be using the most recent and powerful version of the software because it’s updated by the developer then implemented seamlessly. No programs to install on your computer. No upgrades to keep track of and buy. Nice! Collaboration: if you work with a team of individuals located in disparate offices, web-based apps allow you to easily share data and provide centralized hubs of communication. Data Protection: most companies that provide web-based applications all have back-up procedures in place to maintain the safety and integrity of your data. I would hazard to guess that most people do not keep adequate back-ups of the data on their computer (I confess that I fall into that category). The more info you can keep in the Cloud, the less you need to worry about losing it to fire or earthquake. (Note: when you do sign on with a web-application, if critical data is being stored, ensure the company does indeed have adequate redundancies. I used to have my company website with a web host based in New Orleans. When Katrina hit, my website when down and the company had no back up servers to get the site up and running in a short amount of time. My site was down for about a month! The common obstacle I hear to adopting web-based application is fear. Either fear that critical data will get into the wrong hands (e.g. identity thieves accessing your credit card info), or that your data may be lost. Well, as I mentioned above, most legitimate companies offering web-based apps have adequate back-up procedures in place. With respect to critical data getting into the wrong hands, truth is, if you have any kind of access to the internet (which you must if you’re reading this article), then your data is accessible by anyone with the wherewithal to get at it. Your data may actually be safer if stored on the computers of a company that has advanced security and encryption technologies installed on their servers. If you’ve held off adopting web based apps for your business, I encourage you to go for it. Start small then expand. Tomorrow I’ll give you a list of my favorite web-based apps and how I use them for everything from sales and marketing to writing movie scripts. Ron,Can you provide a few examples of 'cloud' based applications that you've found useful and stable? As an IT professional, I'm very familiar with the concept, but for my personal use I've yet to investigate how I might use web-based apps for my photography and graphics work. I use multiple computers myself and I also travel a decent amount, so this is something I plan on implementing for myself in the near future.Just curious to hear some specifics on what and how you've implemented it yourself. Oops, sorry! I'll tune back in tomorrow! !